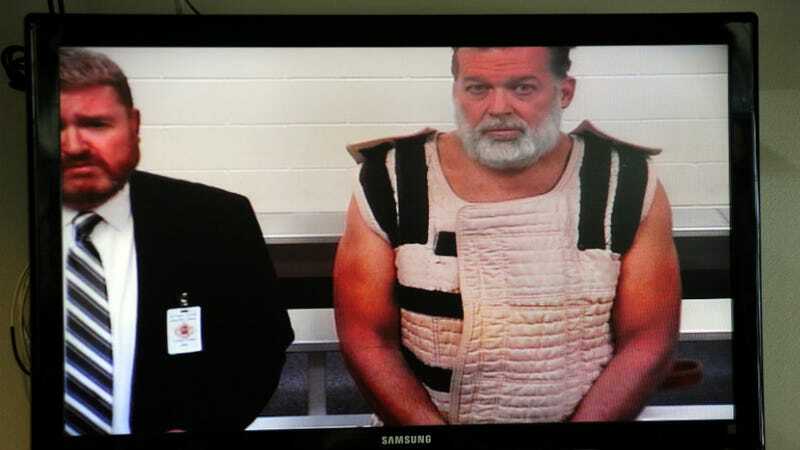 Alleged Colorado Springs Planned Parenthood shooter Robert Dear appeared in court for the first time Monday afternoon. He was present by video conference from the El Paso County Jail, where he is being held without bail. He’s been appointed public defender Dan King, the same attorney who represented Aurora theater shooter James Holmes. In the brief hearing, Dear could be seen wearing a safety smock, a suicide-prevention garment made out of thick quilted fabric. According to NBC, he was informed that the first-degree murder charges he faces will mean a minimum of life in prison if convicted and a maximum of the death penalty. Dear is due back in court December 9, when he will likely be formally charged. Meanwhile, horribly, Colorado Springs Gazette reporter Chhun Sun reports that a man has been arrested near Memorial Hospital for allegedly threatening to kill one of the recovering Planned Parenthood shooting victims. Both Memorial and Penrose Hospital were placed on lockdown while police searched for the suspect.